The Smithsonian offers wonderful online resources for students of all ages. The Smithsonian's Learning Lab lets teachers create collections of resources. But you don't have to use the Learning Lab to use many of the activities available through the various Smithsonian channels. Here are five good online activities available through the Smithsonian. These are activities for elementary school students. How Things Fly is a feature from the Smithsonian National Air and Space Museum. 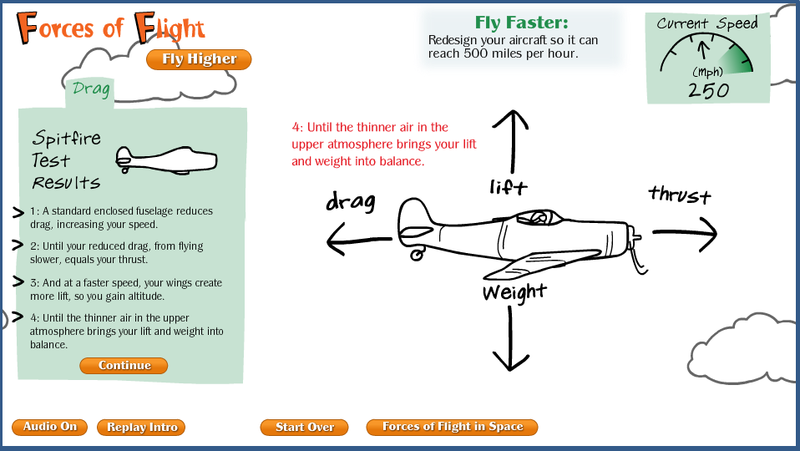 How Things Fly contains an interactive module in which students design their own airplanes. The activity starts with a simple and slow airplane that students have to modify until it reaches a target speed and altitude. As students modify the wings, fuselage, and engines of their airplanes they are given instant feedback on the effects of those modifications. In some cases the feedback includes the airplane crashing and the students having to start over again. Shutterbugs Wiggle and Stomp is an educational game produced by the Smithsonian. The purpose of the game is to help children recognize the movements of animals. In the game children move through a virtual zoo with a zoo keeper. As they go through the virtual zoo the zoo keeper will ask students to take pictures of animals who are demonstrating running, jumping, stomping, and other movements. Shutterbugs Wiggle and Stomp can be played online. The game is also available as a free iPad app and as a free Android app. The Smithsonian Science Education Center's Weather Lab is a simple online activity designed to help elementary and middle school students learn about weather patterns. In the Weather Lab students select an ocean current and an air mass then try to predict the weather pattern that will result from their choices. The Weather Lab provides an overview of the characteristics of each air mass and ocean current. Students should use that information in making their weather predictions. After making their predictions the Weather Lab will tell students if they were correct or not. In the feedback given to students they will find links to videos for further learning about each weather pattern featured in the Weather Lab. Habitats is a fun little game from the Smithsonian Science Education Center. The online game challenges elementary school to match animals to their habitats. The game shows students images representative of four habitats; desert, coral reef, jungle, and marsh. Students drag pictures of animals from a list to their corresponding habitats. Students receive instant feedback on each move they make in the game. Once an animal has been placed in the correct habitat students can click on it to learn more about it in the Encyclopedia of Life. The Smithsonian Center for Folklife and Cultural Heritage has some neat resources for teachers and students. One of the resources that I like is the Masters of the Building Arts Activity Guide. The Masters of the Building Arts Activity Guide provides the history of six types of buildings and architectural features. At the conclusion of each section there is a hands-on activity for students to try in your classroom. For example at the end of the section on timber framing you will find directions for an activity in which students attempt to create a model building with straws or pipe cleaners. At the end of the section on stained glass students can try to create their own "stained glass" panels with tissue papers, ribbons, and glue.